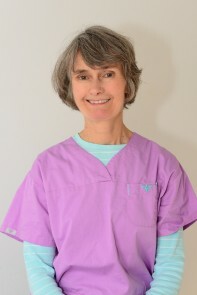 Martha McLaughlin has been a Physical Therapist Assistant at Falmouth Physical Therapy since 1994. She first came to the clinic on an affiliation for her PTA program at Newbury College and began as an employee shortly after graduating. Martha has lived in North Falmouth for over 30 years – summered here all of her life. She grew up in Braintree, MA. Her original degree was from Boston University in U.S. History. She and her husband, Pat, have two grown children, Kevin and Buzzy (Priscilla) who went through the Falmouth Public Schools. Martha particularly enjoys working with the senior population of our community. Although she works with a diverse range of patient’s diagnoses, Martha particularly enjoys helping Seniors increase their strength and balance while improving their gait. She is certified as a senior strength trainer by The International Weightlifting Association and has attended other courses related to issues encountered with aging, including Jennifer Bottomley’s course on Geriatric Neurology. Running, Kayaking, sailing, cooking, knitting and hanging out with her family keep her busy on the weekends.